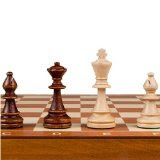 This Tournament Chess Set #6 with Board would make a great gift idea for the guy into games. This set offers a No. 6 tournament standard size folding wooden inlaid chess board with each Staunton chess piece individually handcrafted. Made from renewable plantation wood. Checkmate!